Unfortunately my wife and traveling companion recently passed away and solo traveling is not my preference. So I'm selling this well maintained and cared for RV. All the required maintenance has been done, and all the minor factory bugs have been corrected. 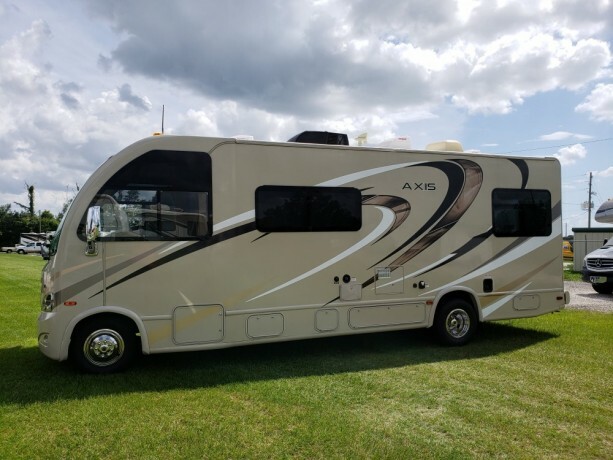 The RV is fully equipped including all kitchen appliances, hook ups including surge protectors, and water pressure gauges , gas grill, ladder, chairs, etc. All that is needed for the first trip is your food and clothes key in the ignition and your off on your first adventure. The front end was aligned when I took delivery in Elkhart, IN. In addition to the standard equipment, I have a bedroom and outdoor television, 12V attic fans in the living area and bedroom, A/C has been upgraded to 15.0 BTU, and a second house battery has been added. 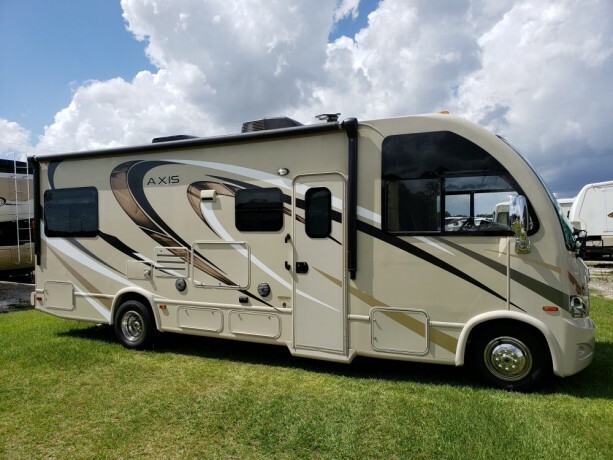 Model 25.2 features a rear slide out for added interior space without increasing the overall length for travel, plus all the amenities you need including a full kitchen and bath, as well as sleeping for four!. Step inside behind the passenger seat where there is a 32" LED TV mounted above for viewing easily from the jack knife sofa straight ahead. There is a pedestal table for dining, and this can easily be converted to a 40" x 76" bed. You will also find two sets of seat belts to keep your passengers safe as you travel. To the left of the entry door find a counter with round sink, flip up counter top extension, a three burner range with overhead microwave oven, and pull out pantry, plus refrigerator. In the cab area you can enjoy a coffee table between the seats that swivel, plus there is a drop down overhead bunk above that converts to a 38" x 73" sleeping area if needed at night. Head toward the rear of this coach and find a complete bath on the right with a sliding door. Inside find a 30" x 36" shower, toilet, and vanity with sink, plus overhead storage for towels, toiletries, etc. There is also a wardrobe on the opposite side of the unit just before the rear master bedroom. In the bedroom find a slide out queen size bed that is a step up from the main floor. You will also find overhead cabinets above along with nightstands on either side, plus an 32" LED TV. Outside is an electric awning with LED lighting a 32" LED TV with stereo speakers. We've seen this coach, and can vouch for the condition as described. With around 14K, it will be a great value for some lucky folks. harleyhal, can you post a photo? Hey, Hal- This is still on the market, right? Those small photos don't really do it justice. Can't believe someone hasn't snapped up this creampuff! good morning Hal, I accidentally deleted your contact info. We would like to discuss the RV some more. We have a few questions.